Pets or wildlife: which do you prefer? Current Questions – what are they? The new Grant Museum will be a place to get involved in questions about the life sciences. The first question we are asking is “Pets or wildlife: which do you prefer?” You can get involved in the discussion on this blog. We want people to interrogate what it means to be interested in animals. 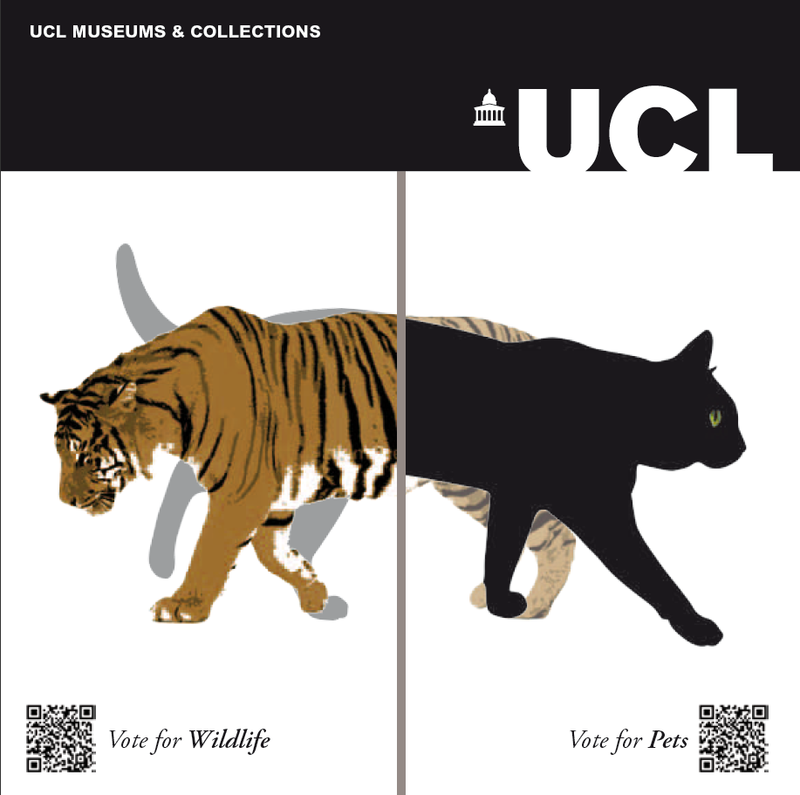 We are a zoology museum – people come to visit us to see animals – and we want to discuss how animals you see everyday (pets) relate to the wild animals represented in the Museum. Do you think about pets in the same way you think about wild animals? What positive impacts does keeping pets have on wild animals? What negative impacts does keeping pets have on wild animals? Can the positive impacts of keeping pets (e.g. company) ever outweigh the negative impacts on wildlife (e.g. wild caught pets; carbon footprint of pet food)? Is a society that supports pets by definition anti-wildlife? Why do people have a stronger reaction to a domestic cat preserved in the Museum than to an endangered snow leopard? What is the difference between wild and natural? Well, this is something I’ve been thinking about for a long time- but people following this debate might be interested in listening to this: http://www.radiolab.org/2010/feb/19/lucy/ that I discovered just yesterday. Two stories about animal research where the boundaries not just between pet and wildlife but between human and… other species, get thoroughly entangled. I don’t think of domestic pets and wild animals in the same way. Obviously the preservation of all the earth’s biodiversity is my impossible dream, i.e the natural world in its entirety (both plants and animals) would be my top notch cause (even the smallpox virus!). However, all animals are interesting and important and this is not a simple yes/no argument. The relationship of humans and their domesticated animals, which resulted in the ‘evolution’ of a varied stock of breeds to fit a great number of niches, is absolutely facinating. People can have an amazing affection and rapport with their pets, but these animals can also be treated appallingly, cruelly abused by humans. Shame on us for dragging them into domestication so that they have to rely on us and can no longer survive ‘in the wild’. But I assume what is to be debated here is the anomaly whereby an owner will happily tackle the pet ‘poo’ in their garden, but be revolted by fox ‘poo’. Or the reported incidents of owners wanting adders or foxes to be killed so that their pet rabbits and dogs are safe from being harmed by the wild visitors. The real problem with pets is irresponsible ownership, including pets as fashion accessories and status symbols. If pets were neutered, fed appropriately, dogs exercised sensibly, cats kept in at night etc., there would be less impact on wildlife. The pets in this debate may be primarily dogs, cats, horses, hamsters, tarantulas, parrots etc., but should we not extend this to all domestic animals? Cows for milk, beef cattle and other grazing animals have a significant impact on the environment. The real debate should be ‘how are we are going to restrict the numbers of the most destructive animal on the planet’ – us.